Do you feel like you are reinventing the wheel every time you analyze your fundraising performance or pull a solicitation list? Are you concerned that you are getting inconsistent results? Then you need a standard list of go-to reports to keep you on track and make your operations easier. Here are a few steps to follow as you identify your go-to reports. 1) First, inventory your fundraising programs. How do you raise money? 2) Consider your needs through two lenses: operational and analytical. Operational – reports needed to run your daily business. Examples include gift acknowledgment, solicitations, and donor communications. Analytical – reports designed to help you understand your performance. Examples include total dollars raised, solicitation performance, and email open/click rates. 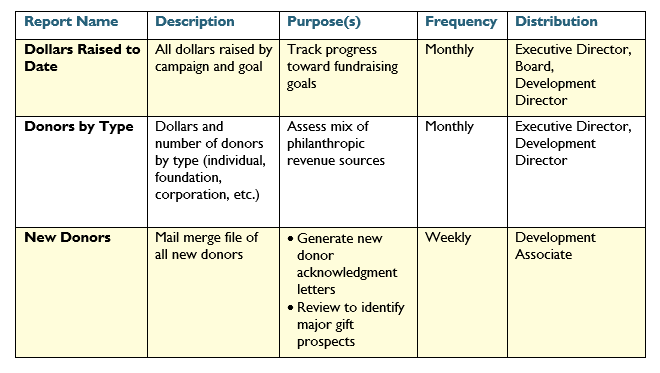 3) For each of your fundraising programs, think about your business processes. What are the steps you routinely follow to get the work done? Which of these steps require generating reports from your database? These are your go-to operational reports. 4) For each of these areas, also think about how you measure success. Whether or not you have formal metrics in place, it’s important to look at what’s working on a regular basis so you can adjust your strategies. Acknowledgment reports, pledge reminder reports, and other gift processing reports. You may use these reports to generate receipts/acknowledgments directly from your database, or you may do a mail merge. 5) Design your reports. We’ll be talking report design in Reporting: Make it Easier to Get Data Out of Your Database. 6) After you have determined your critical reports, keep track of them by creating a report index (preferably in Excel or another spreadsheet application). Include the following columns in your table: Report Name, Description, Purpose, Frequency, and Distribution. The name should correspond to the saved report name in your database. Use the description to give more information about what is contained in the report. The purpose is the reason you are running the report (“the why”). Frequency and distribution describe how often the report is run, and who receives it. For more help developing your go-to reports, please check out Reporting: Make it Easier to Get Data Out of Your Database, a webinar in the Make Your Donor Data Work series.